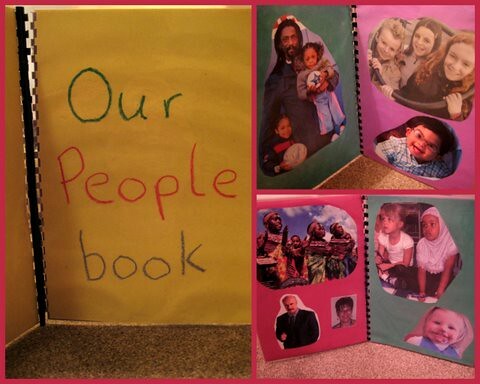 We’ve had our People Book for a couple of years now and it’s loved by the babies and toddlers who read it. Very young children are naturally drawn to looking at faces, so why not capture their interest by making a book of their favourite faces for them. Our book includes lots of pictures of people the children know: themselves, family and friends. They just love it when they spot someone they recognise! It also provides lots of opportunity to chat and ask questions about what everyone looks like, and to play i-spy. We’ve added in some pictures from magazines so we could include a whole range of people: different ages, sexes, hair and skin colours, wearing glasses, wearing headscarves, in wheelchairs, in different family groups. It’s a good way to introduce aspects of the world to your child – and if you’re working in an early years setting and wanting to provide multi-cultural resources, this is a great way to reflect your society. It can also be a useful way to link home and an childcare setting, as you can ask parents to send in some pictures from home for you to include. You could also make a version that includes faces showing different emotions, and begin to talk about having different feelings. We glued our faces onto coloured sugar paper, laminated them and then bound them together, which gave us a sturdy book which has lasted lots of toddler handing. If you don’t have access to a laminater, a photograph album or a scrapbook are good alternatives. Do you make you own books with your children? Do they read them as much as other story books? Great idea – we have done this with both kids – we cheated slightly and used the easy slip in photo albumns, including photos of family members and friends, as well as pictures of favourite animals, objects etc. With both children these were one of their favourite books to look at. Hey KidsTravel2, that’s not cheating! I think they’re a fab way to get them enjoying books and talking about what they see. I’ve made faces books of our family for both boys. I made them on snapfish. A lot of the photo sites have really good deals this time of year! That’s a great tip Jackie, thanks.